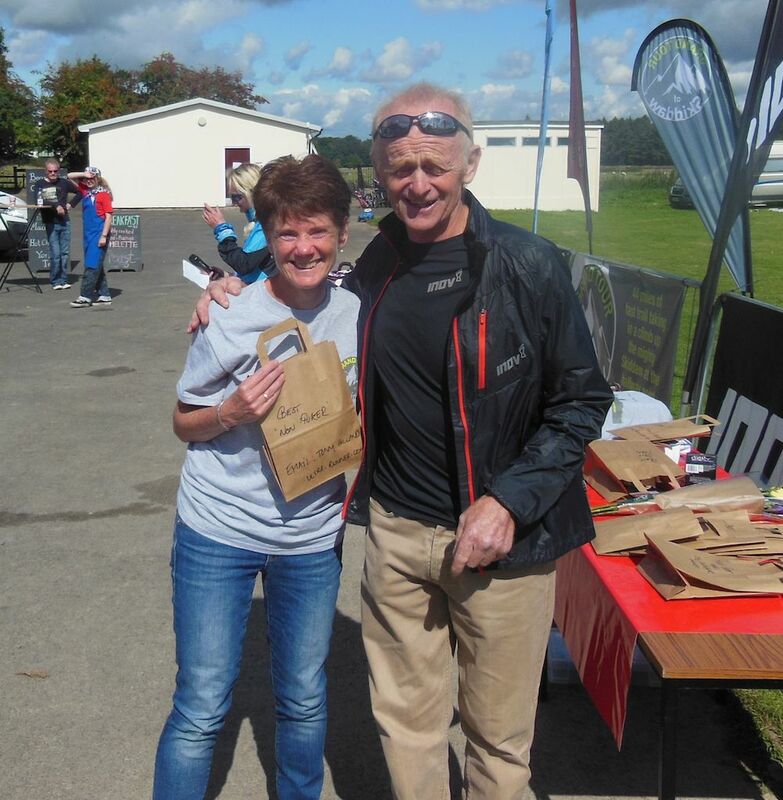 I think I heard about this race at the Highland Fling in April from Race Director Gaynor Prior and immediately was keen to take part. 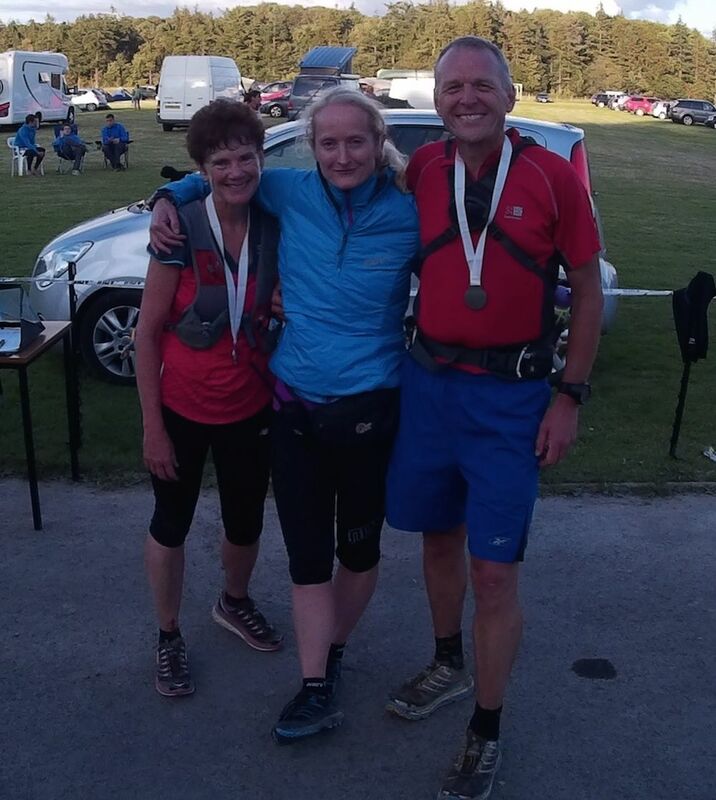 This year I am running in the Hardmoors Grand Slam which is a series of 4 races (30, 55, 110 and 60 miles) from January to September. The final race of the series is on Saturday 20th September so this race four weeks before was an ideal day out. Katrina was also keen to join me so we decided to enter as a team so we could run together. I couldn’t come up with anything more original than ‘Team Kynaston’ so that was our name. 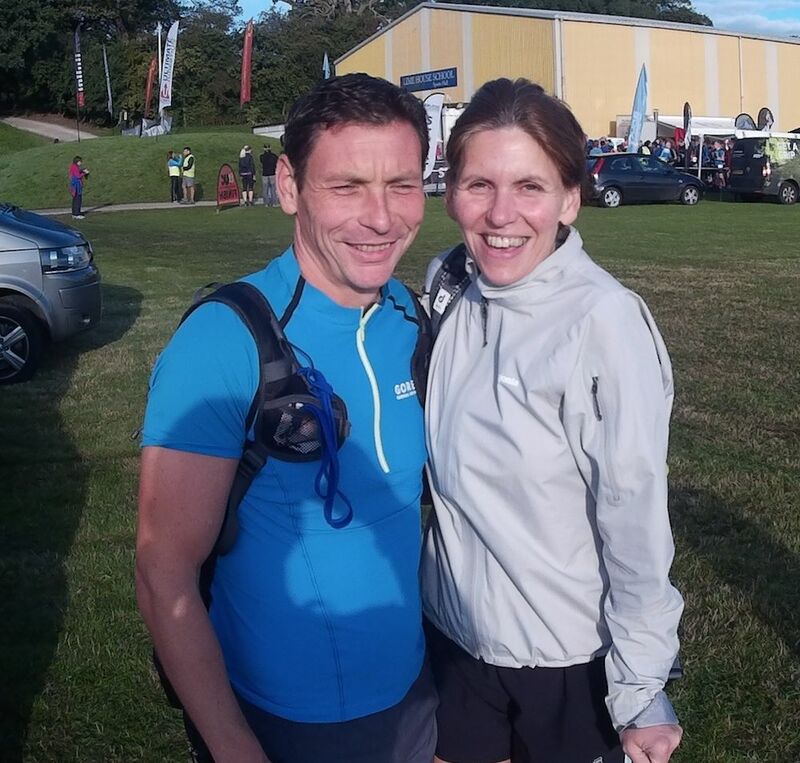 Our friends Jonny and Frances were also keen to do the race so we travelled down and shared the weekend together. 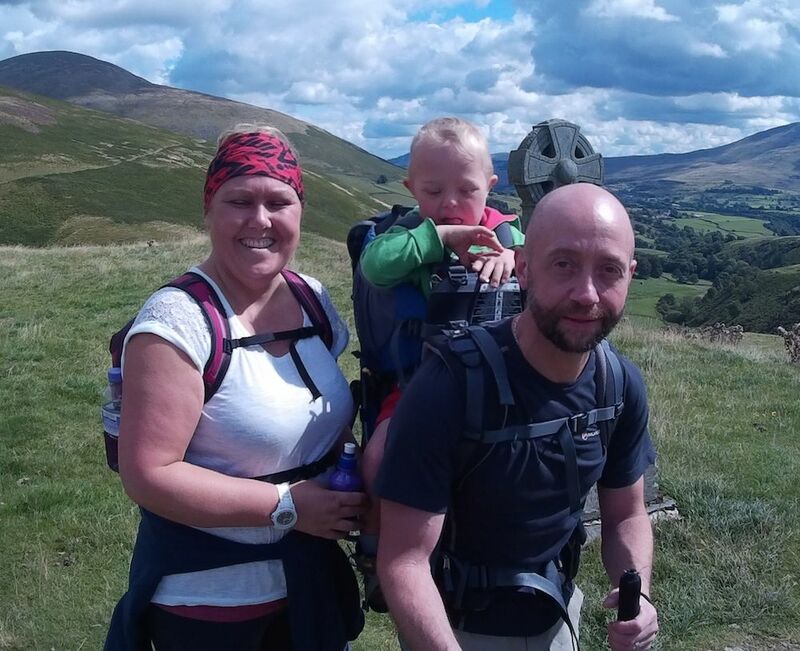 Katrina is building up to the Loch Ness Marathon so was dividing her training between road and trails. 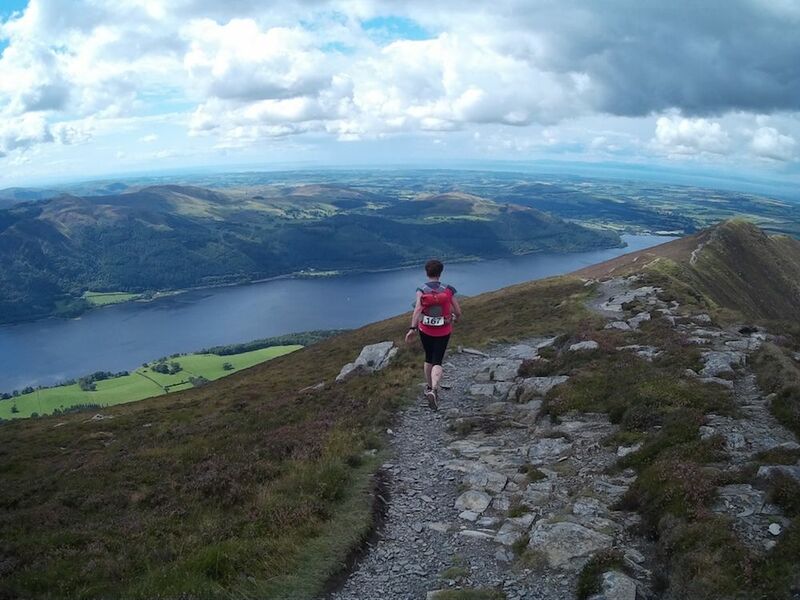 We had a few trips up and down Ben Lomond and a 30 mile recce run on the course over the last few weeks to prepare. We drove down to Lime House School after work. We arrived about 6pm to registered, kit check and receive our timing ship and number. 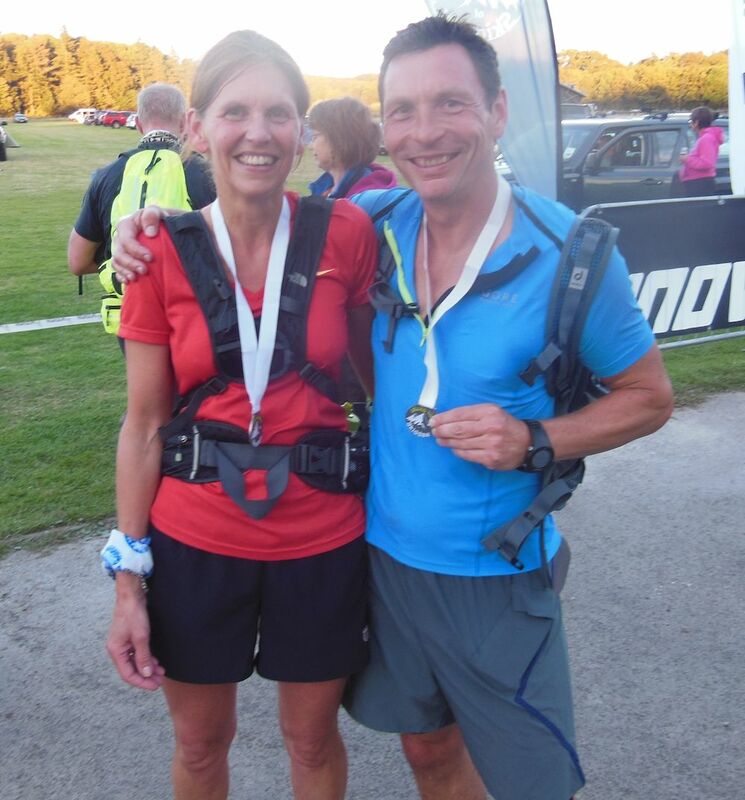 Most runners were camping on the school field but Dave & Tracey kindly offered us their house in Keswick to stay in so we headed there and went out for a meal. We were up by 6am, breakfast and then made our way to the start in time for the race briefing. The weather looked great and we had sunshine for the whole day. 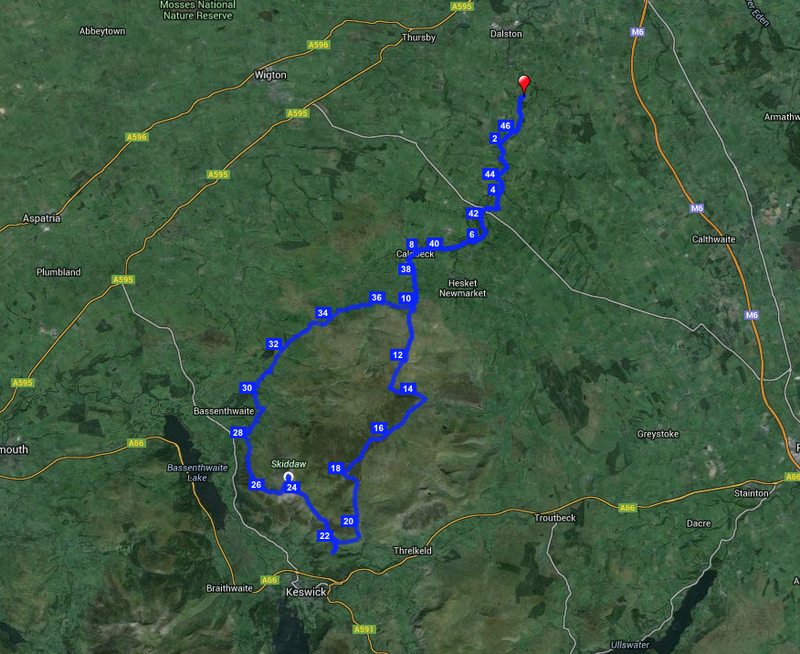 The route is shaped like a frying pan ….. 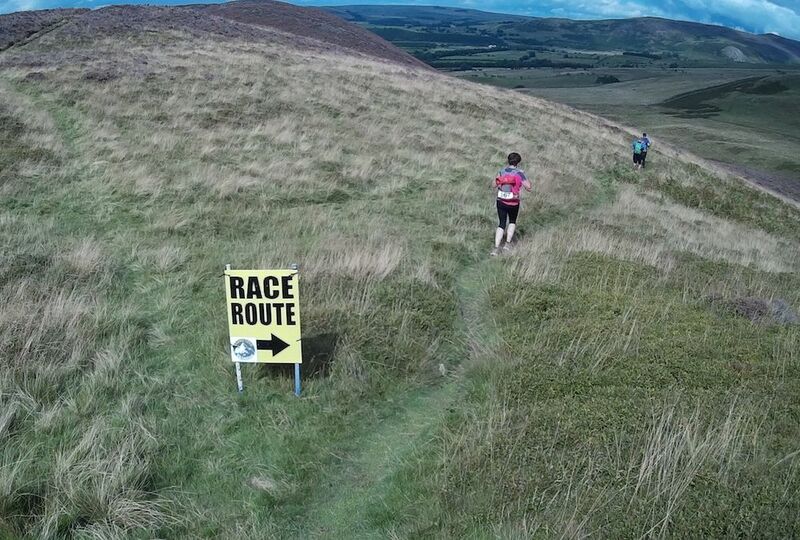 Overall the route has over 7,000ft of ascent and descent …. I think there were about 100 solo runners and 14 teams of 2. It was good to see Andy Cole at the start. 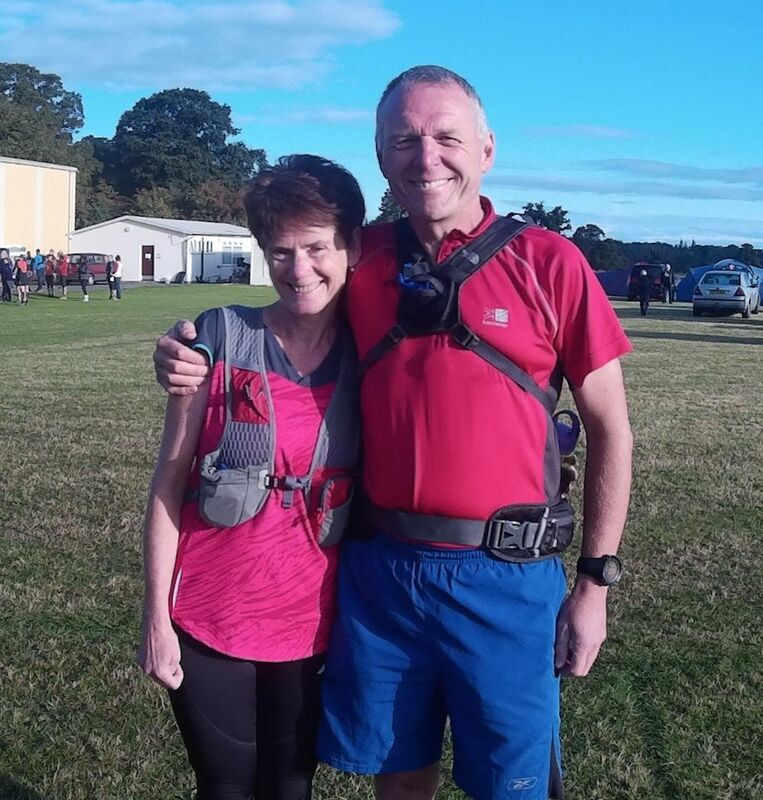 A photo of Katrina & I at the start …. We deliberately started near the back of the group as I really wanted to make sure we went off slowly so that we could run right to the end. After about 2 mins of running through the school ground we came to the first of the many ‘kissing’ gates. There was a hold up of a few minutes as we waited our turn to go through. 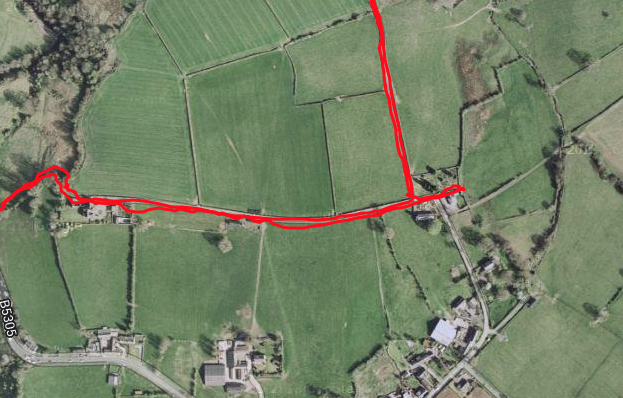 The first 4 miles or so followed the stream across fields and tracks. 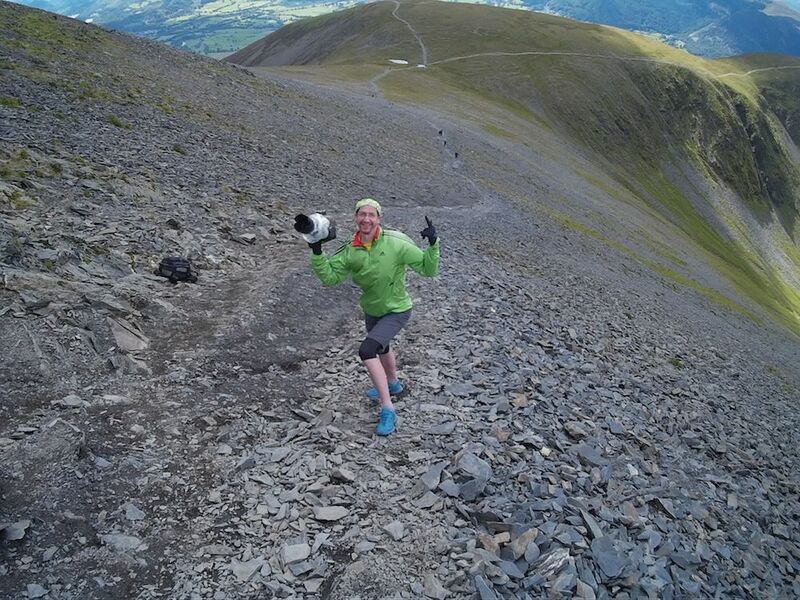 Tony Holland from the ultra-runner shop ran with us for 5 miles or so before heading back to collect his wife and child and drive round to Skiddaw. It was great to chat to Tony about his shop and charity work. 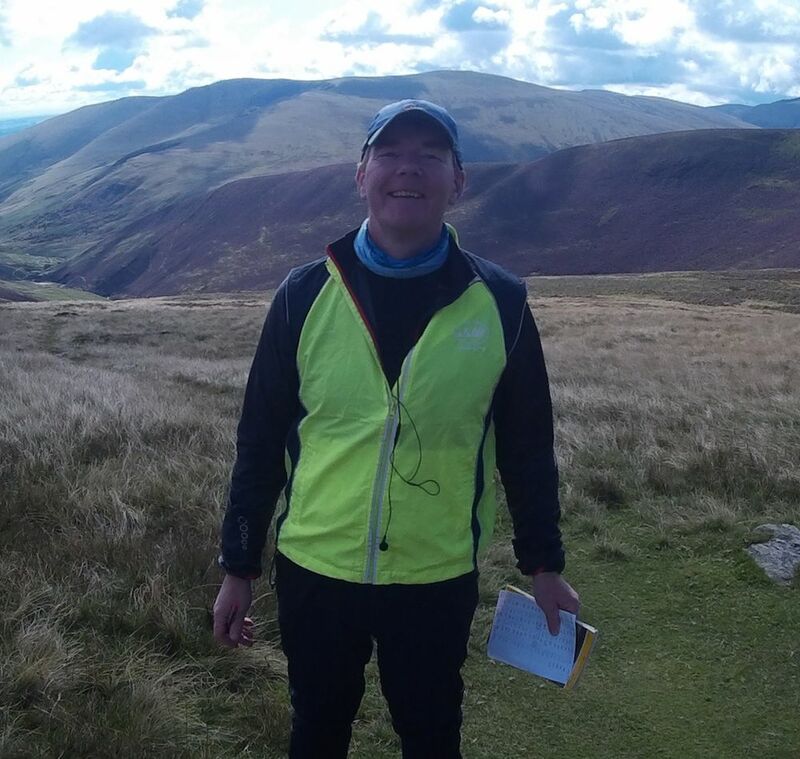 Tony is running Glenmore 12 in a couple of weeks so we look forward to seeing him there as we are going to support and marshal. We also ran with Jonny & Frances but when they stopped for a ‘comfort’ break we carried on and that was the last we saw of them until the end. I took a mini-split at 4miles. It had taken us 48:36 and we were feeling comfortable. It was warming up with hardly a cloud in the sky. It was going to be a great day! The path was very clear and mainly dry but there were a few places where it was very muddy. 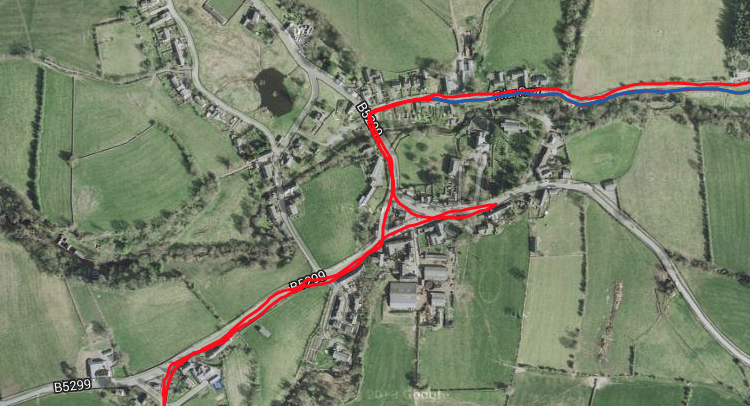 Before we reached Caldbeck we had a climb then a descent so we noted that for the return journey. 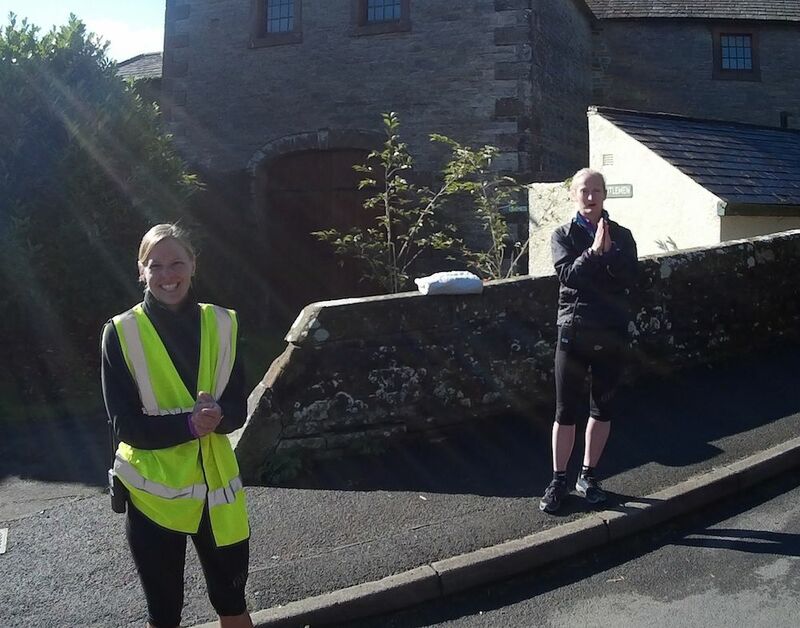 We came into Caldbeck running well and happy to be at the first checkpoint. This is where we started our recce run 3 weeks ago so we knew the way from here and what was to come. We were in and out in a couple of minutes as neither of us like to stop for too long. We made our way along the lane and then onto a path which takes us past Chris Bonnington’s house, past a farm through a couple of gates and then out onto the fells heading up to High Pike. Katrina’s Garmin Foreunner 101 doesn’t have a long battery life so I suggested she switches it on at the 10 mile point to make it last until the end. As we started the climb up it was 10 miles and almost exactly 2hrs so that would be easy for her to add on to get the overall time and distance. We were climbing well and catching a few people ahead. In the end we settled behind number 58 and followed him all the way to the top. As you may know I like to have some mini-splits as they help me to break the race down into bit sized pieces. I had guessed 1hr 40 to Caldbeck and we were 3 mins inside that even though I thought it was 7.50 miles. Then the rest of the way I had our splits from our recce run and I thought it would be interesting to see how we ran compared to them. As we were climbing up I mentioned all this to Katrina as we were going to be at least 5mins faster on the climb to High Pike than the recce. I thought this would encourage her but she found it created some pressure so I was asked (told) not to tell her any more splits!! So from then on I kept them to myself!! We reached the top in 52:28 and headed down the other side. From our recce run I knew that Pete would be at the hut to check all the runners through. I thought the hut was quite close to the top but it a bit further than I remembered. We paused to take a photo of Pete before heading on. All the marshals on the route were superb. 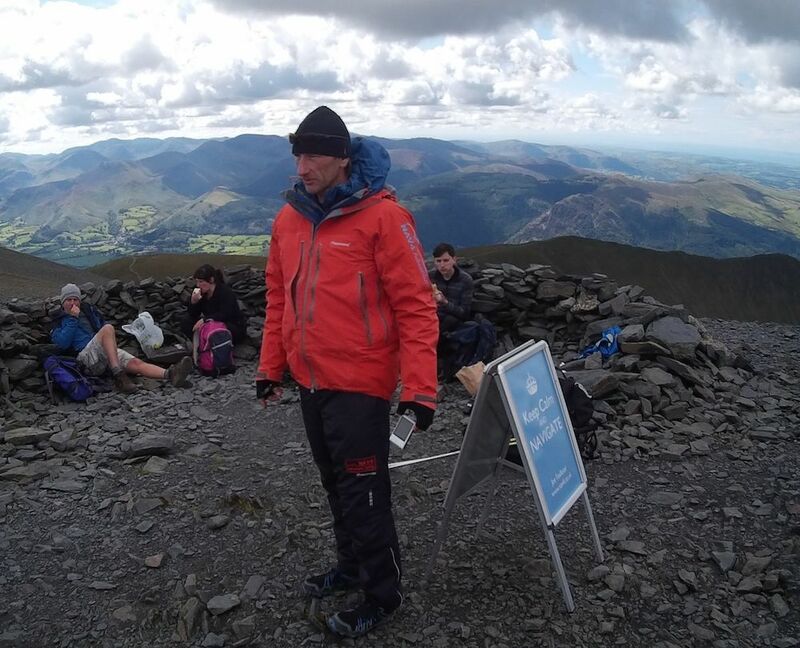 I think particularly those on the more exposed locations like this one and on the top of Skiddaw were great, encouraging runners and making sure everyone was safe. By the time we reached the beck and turned left to follow the path down the valley a few runners had caught us and about 7-8 went past us as we made our way down. We weren’t quite so confident descending through the rocks and fern. Once we got onto the better path we made good progress all the way to the bottom and the bridge. There is a little cut off to the right that Gaynor showed us but 2 guys in front stayed on the path and went round. I knew we could cut down but that would mean we would jump ahead of them and I didn’t want them to think we were cheating so we went the slightly longer way round as well. The couple behind us didn’t think the same as us though as they cut down on the correct path and were ahead of us! 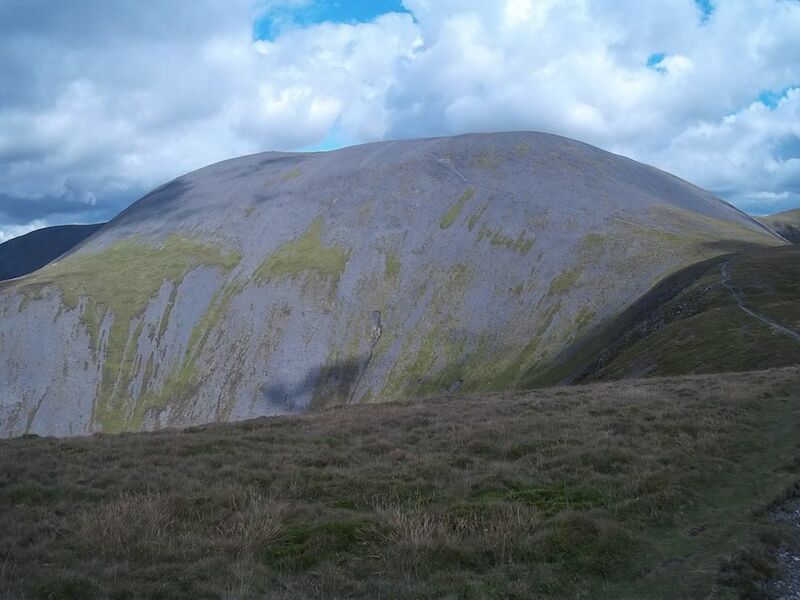 We had taken 36:25 to descend from High Pike compared to 48:26 on the recce run not that I told Katrina that!! So it was clear we were going well and keeping up a good pace. 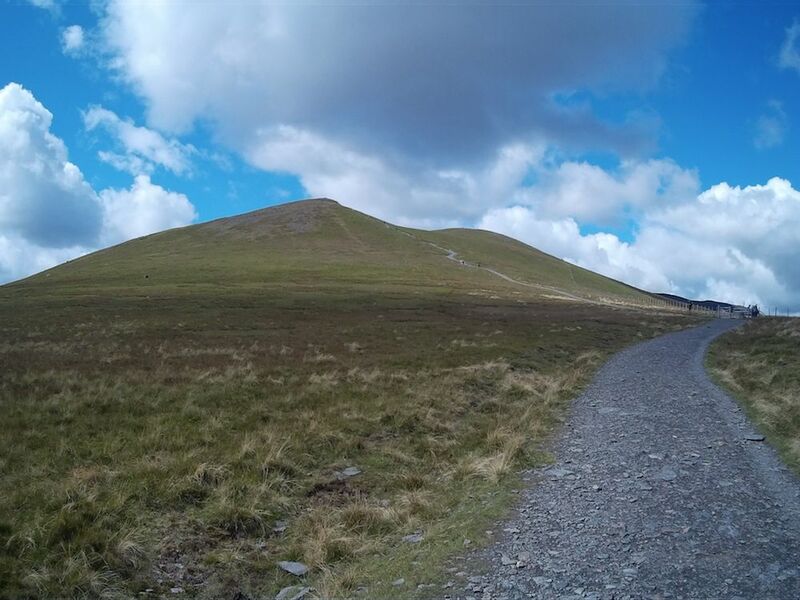 The next section of the route to Skiddaw House Youth Hostel is very runnable and I was encouraging Katrina to settle into an easy run that we could keep going for a while. We overtook some of the runners who had gone past us earlier on the descent. 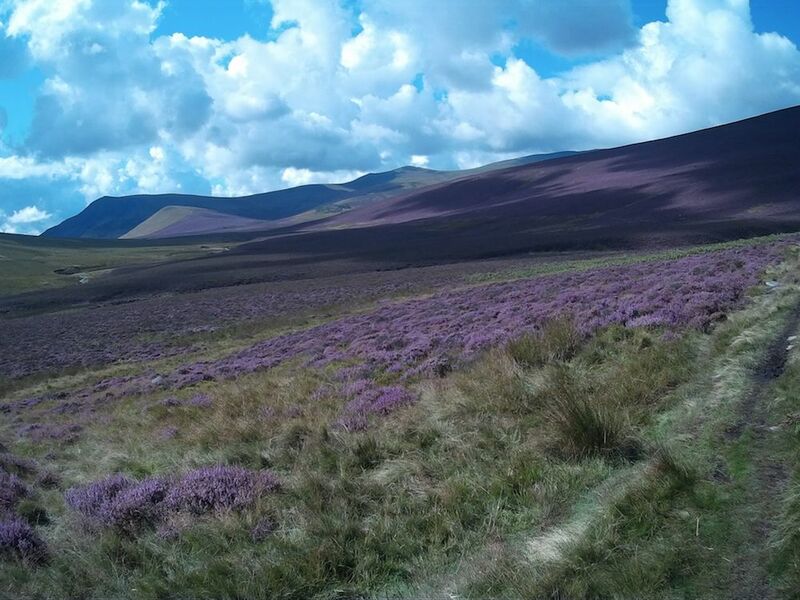 The views of the purple heather were superb and we were going well. A few minutes later Katrina said, ‘I’m not enjoying our day out quite so much now!’ We had been running for almost 4hrs so it was not surprising that she had a dip at some point. In previous ultras I know that Katrina hadn’t eaten enough so I was trying to make sure she ate at least something every 45mins or so. She had some fudge and was soon running strongly again. We climbed up to the Youth Hostel which was my next mini-split. Again we were a few minutes quicker than the recce. This is the longest leg of the race so I’d made sure I had a couple of full bottles with my energy drink and that Katrina’s 800ml bottle full. We drank all of it and refilled Katrina’s from a stream. We caught a few more runners on the way to Latrigg Car Park and saw a couple of runners going the other way on a training run. We arrived at the checkpoint in 23mins faster than my sub 12hr goal so I was pleased! Dave and his crew were very efficient in refilling our bottles and we took a 9 bar each and I had a piece of soreen. We only stopped for 1min 36secs and we were away again. Almost immediately Katrina felt sick and had 3 goes at getting something out! She felt a little better and drank a bit of coke to take away the taste. Not far up the hill we saw Tony, Tania and Jack. It was good to see them and I took a photo! Just after we saw them I realised that I’d forgotten to take our drop bag! There wasn’t too much in it so it was not a big problem. But I’d put my mini-split cards in the bag for the next 3 sections so I didn’t have my splits to work on!! It didn’t bother Katrina but I had to rely on my memory which wasn’t so good. We knew from the recce that it was a steep climb to begin with before it eased off for a while before the final climb. The path is so wide and lots of people were making their way up and down. My favourite group were a family with mum, dad, boy and girl. The girl was striding ahead with her dad while the boy lagged behind with his mum. There is only really one decision navigation wise on the way up. One path goes up to the left up an extra top while our path goes through a gate to the right. A runner ahead was standing looking at his road book. I must admit I thought we were going up the hill but Katrina said she remembered we went through the gate. Sure enough Katrina was right as we saw the message Gaynor had put on the gate to show us the way. We kept a good pace all the way to the top enjoying the views as we went. It was quite windy on the top and a fair bit colder but we decided we could manage without putting on our coats, as we would soon warm up on the way down. 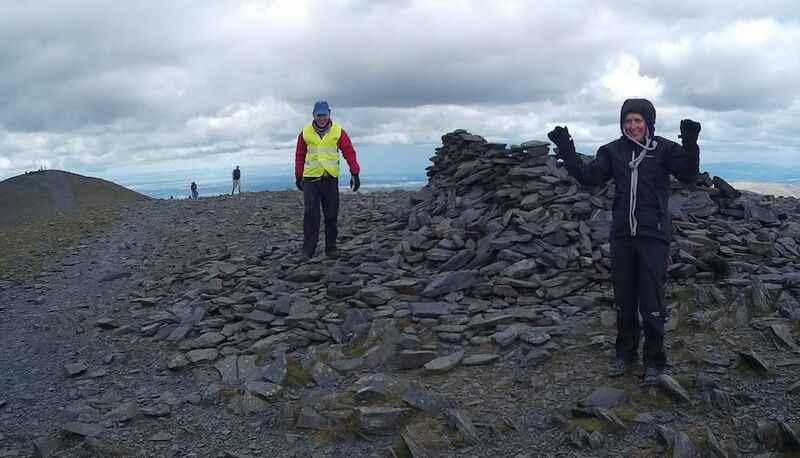 We chatted to a couple of marshals at the cairn showing the way down as we went past on our way to the top. At the cairn was a bell that we each had to ring to say that we had made it. On the recce the climb took us 1hr 6mins. I think this was the only leg that we were slower on as it took us 1hr 12mins. I blame Katrina being sick!! We knew from the recce that the descent off Skiddaw was going to be the worse part of the route for us and it was!! Even though Katrina had new Hokas with more grip she didn’t enjoy it at all. So we made our way slowly down the hill past this guy taking photos. Once we got down we looked at the path and it looked as steep as it felt. Once we were on the ridge we ran as much as we could and once again enjoyed the great views of Bassenthwaite Lake and all the hills around us. We even saw a hang glider circling ahead. There were a number of folk making their way up. We came across a group of maybe 3 families with lots of children. What a surprise was that one of the adults was the guy in the rabbit onsie who opened the gate earlier! We made our way down as quickly as we could but a couple of guys caught us by the time we reached Gaynor’s sign showing the path to the right off the ridge. 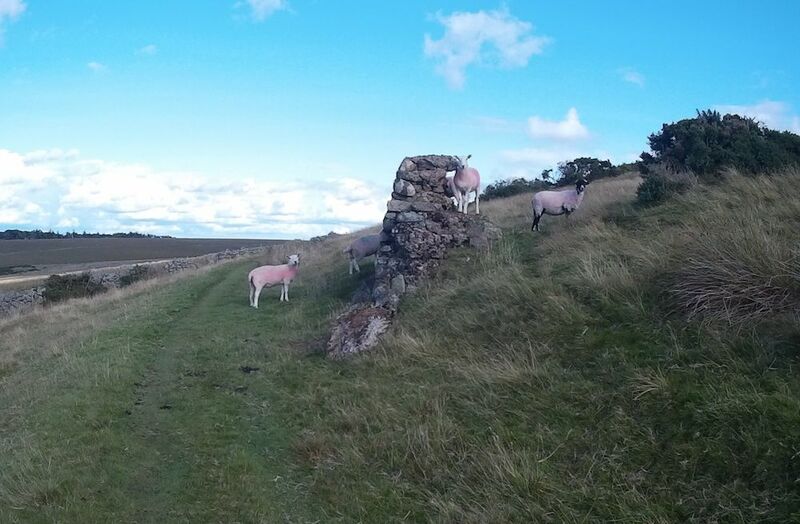 Once we got down a bit further we went past them again. It’s always interesting to see how different runners have different strengths. Our strength was the runnable sections and the technical descents were our weakest. Our quads were in great shape for the gradual descents and the runs down Ben Lomond were definitely paying off. We followed the route through the farm, track, over the river, up through the field and onto to the road to the next checkpoint. There was a good crowd there to meet us and the marshals once again very efficiently refilled our bottles and encouraged us on our way. We took some grapes to eat which were lovely. Andy Cole arrived just after us. He said he’d been chasing us for the last 30mins or so. He said he almost caught us on the hill but once we hit the flatter ground he was struggling to catch us! We were now 41mins up on my sub 12hr time not that I knew that at the time! I did know we were going well and that the worse of the climbs and technical terrain was behind us. The next mile or two is the most difficult navigation wise of the whole route and I was so glad that we had done the recce as there are several places were it would be easy be go wrong. When Andy Cole caught us with a mile or so to go he said he’d gone wrong here. We went through the field were we’d seen the buzzard on the recce run but there was no sign of it so that was good! It was good to get past that section and on to the road. We ran/walked the 2miles strongly still feeling good. The turn off from the road was my next mini-split which looking afterwards we had done 9mins faster than the recce. 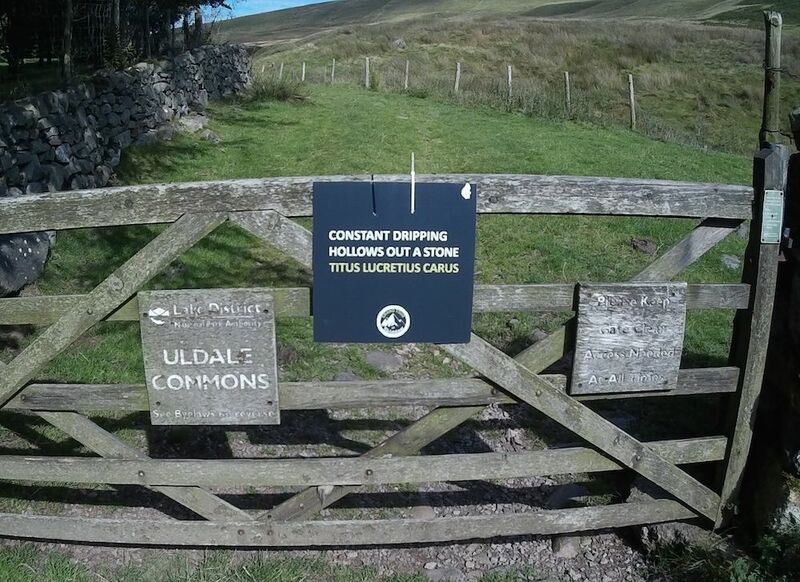 Gaynor had posted lots of inspiration signs on key places on the route …. The climb up that hill was longer than I’d remembered. We were leap frogging with a young guy who was doing his longest race yet. He was going well and we’d see him a few more times before the end. We eventually came over the top then had a lovely run down to the road where we turned right towards Fellside. I was so impressed with how well Katrina was still running. Before the race I was really hoping that we’d be able to run right to the end. By starting conservatively we were able to still be running and hopefully to keep going right to the finish. After another road section we turned right along the wall and followed the path to the farm and then over the field to the top of the handle. We had now completed the full loop and were on our way home! It was just over a mile to Caldbeck then the 8miles to the finish. We were now 9hrs into the race. If we add on 15mins to the checkpoint then that would give us 2hrs 45mins to do the final section to get under 12hrs. On the way out it took us 1hr 40mins so even if we slowed a bit as expected then sub 12hrs was in the bag. If we had a strong finish we could be nearer 11hrs than 12hrs! Once again Katrina ran so strongly down the hill to Caldbeck leaving our young friend behind. We arrived at the checkpoint to be greeted by the marshals. There were a few runners sitting down but we kept standing as we knew as soon as we sat down it would be hard to get up again. I had some tomato soup and a cheese sandwich which went down a treat! Once we had refilled out bottles we were off again for the final leg and the finish. We had stopped for 3mins 13secs which was a lot less than most of the runners who were still there when we left! We had done really well navigation wise up until this point but we (I!) made a couple of small ones on the way back. The first was going through Caldbeck. I missed the turn off left and carried on for a 100 yards or so before realising. We quickly headed back so no real damage done. One of the runners who had spent longer in the checkpoint came the right way and we ran together for half a mile or so before he pushed on. I was just ahead and Katrina walked up a hill with him. I heard a shout and turned round to see Katrina on the ground. Katrina had tripped as she walked so no real damage done but just goes to show how you need to concentrate the whole time. 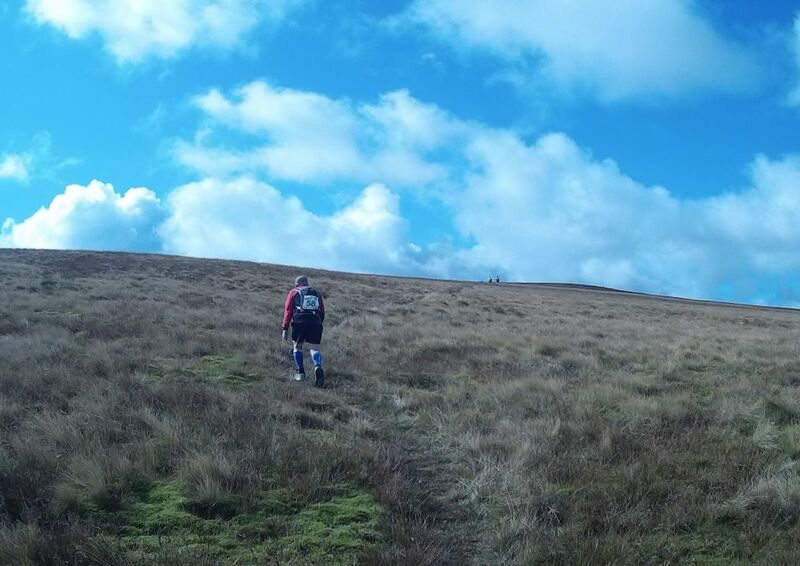 I knew once we were up that first hill out of Caldbeck we should be able to run the majority of the way back. I realised that the overall distance was going to be nearer 46 miles than 44 miles so I gave Katrina a heads up so she didn’t get down when we reached 44 miles and there was still 2 miles to go! At some point along the way we were caught by two French guys who we had seen at the Caldbeck checkpoint. We chatted for a while and I took a video of one of them. They had watched my video of the route and wanted an autograph when the race finished! We were following them as we came to the church and the gate where we had seen the rabbit onsie guy! They went straight on and so did we. When we went through a large wooden gate I realised we were wrong so back tracked up to the correct gate. So again no real damage done. We went past the gate where I’d taken my mini-split in the morning so I knew we had 4 miles to go. I think Katrina would say that these 4 miles did feel a long way. On the way out the fields were nice to run on but on the way back they seemed to go for ages. One runner in yellow went past running very strongly and then Andy Cole caught us. We ran together for a bit before he pushed on to the finish. It was good to come up the final hill and see the school amongst the trees. We were almost there. There were a few girls waiting on the gate waiting for a runner in blue socks. We ran down the road to the finish. There was a good crowd including Gaynor waiting for us. 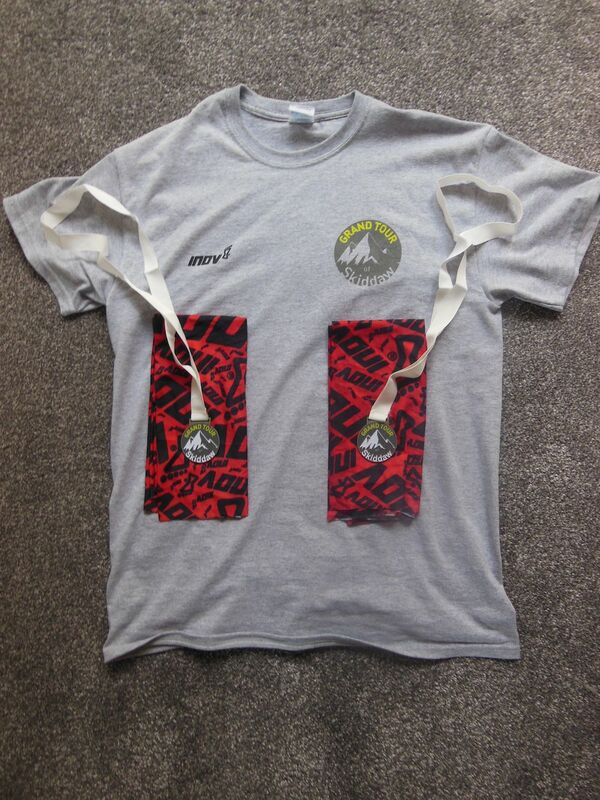 We exchanged our timing chips for a lovely finishers medal. We had done it! We soon were feeling cold but some lovely soup and then a shower helped. We waited for Jonny and Frances to come in which they did just under 12hrs in 11:56. We all thoroughly enjoyed the day. The race was superbly organised and all the marshals and volunteers were excellent. We came back on Sunday for the prize giving. Katrina won a prize for the best non-puker! 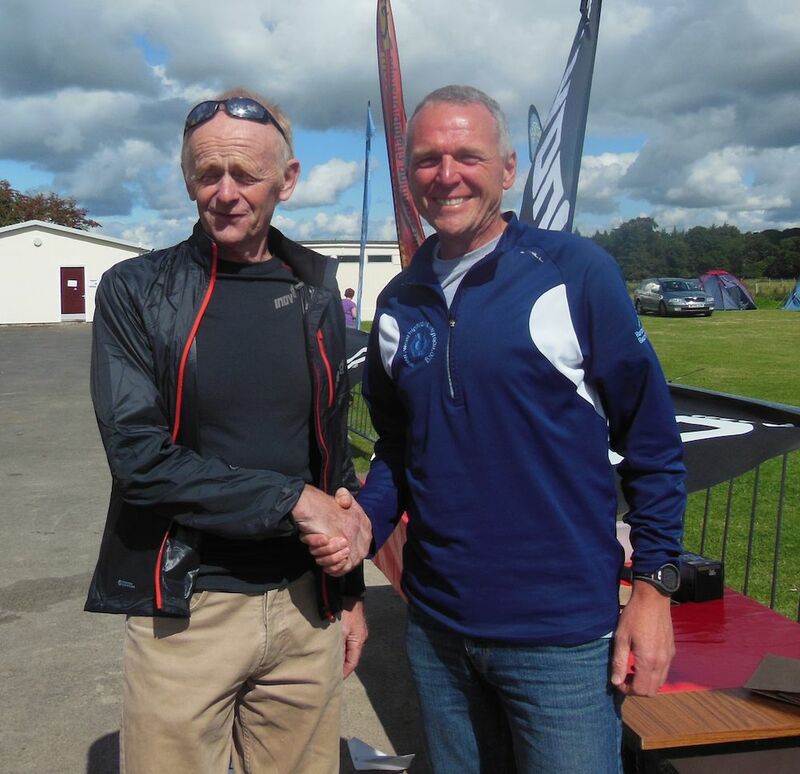 The legendary Billy Bland presented the prizes. Even though I didn’t win a prize I wanted a photo with Billy as well! I will definitely be back again. Thanks to Katrina for sharing the day with me. Thanks to Jonny & Frances for your company over the weekend and to Dave & Tracey for your hospitality in staying in your home for the weekend. This entry was posted in Tour of Skiddaw. Bookmark the permalink.